“[Deprecated] UI Experiment: Click-to-import” – Forum Thread – Discuss – Symphony. This is an open discussion with 11 replies, filed under Extensions. A new extension, "Click-to-import" is now available for download. Comments and feedback can be left here but if you discover any issues, please post it on the issue tracker. Tired of manually importing XSLT utilities inside your file? With this extension it becomes as easy as clicking on the desired row in the “Utilities” right panel. Give it a try! This sounds interesting, but what does it do exactly? @Nils: If you click on a row in the Utilities right panel (see the Utility editor) then the following string is added to the textarea’s content. With $path being the path of the utility you have selected by clicking on its row. Aah! Now I get it! Cool! Nice! I’ve been wanting this functionality for a long time. In fact, I believe this was originally the intended behavior but the team never got around to it. Allen, is that right? This was the behaviour in 1.7, but it was removed in 2.0 when the Allen recommended, and the community requested we use standard methods of importing or including XSL templates. Well… I think it is just natural to click on the right panel to import an utility. Anything that speeds up the workflow looks like an improvement to me (that’s why I love Zen Coding, too! ), and a click requires less cognitive load than writing xsl:import href="". Besides that, what do you mean by “standard methods”? I haven’t tried your extension, but it sounds great to have a way to automate this in the Symphony admin interface. What I mean by “standard method” is that we can import templates according to the W3C recommendation. In version 1.7, it was not done this way. You could only attach utilities through the admin interface as a database setting, rather than being able to do that by the import/include instruction in the page template. As of 2.2.1, clickable XSLT utilities became a core feature. For this reason, this extension is now considered deprecated. 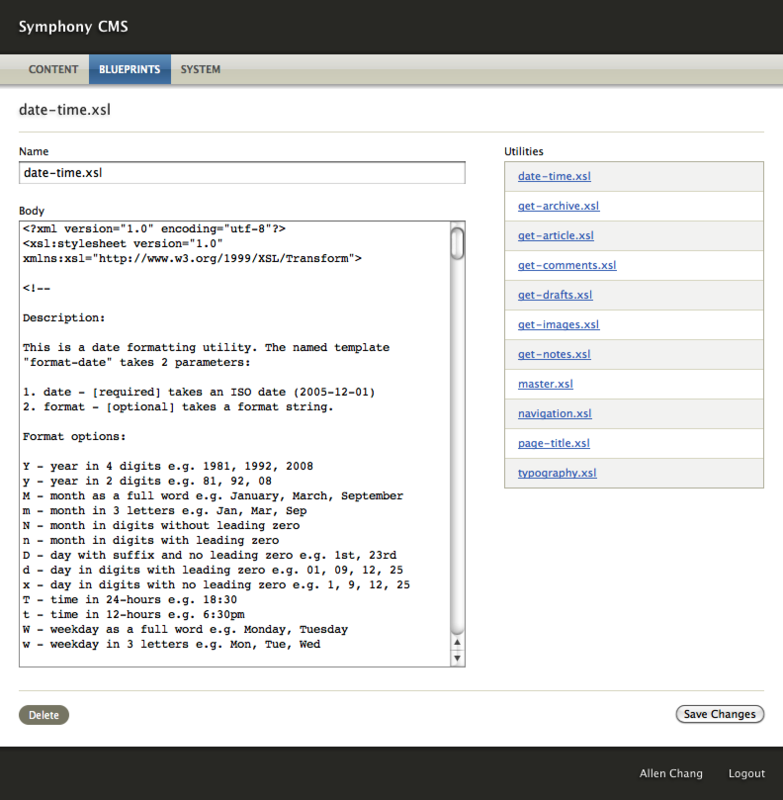 Authors using it are highly encouraged to update their websites to a recent version of Symphony.